"Dog nail bleeding often occurs during trimming or tears. Tears occur when a claw gets caught in material like a rug, plant or crack between the boards of a deck. When the dog tries to extract the nail, or makes a sudden turn without recognizing that one of his claws is caught could result in a torn claw or avulsion. Bleeding occurs as the result of nail clipping or injury that involves the nail "quick," the part of the nail that contains blood vessels (see picture below). Do not be alarmed at the amount of blood. Bleeding can be stopped with an a styptic pencil or powder found at any pharmacy. Often only part of the nail is torn with the condition potentially causing intense pain. Home treatment is possible for dogs that are not in too much pain. If the dog appears in serious pain or there are signs such as a bleeding nail, see a veterinarian. After being treated for a torn dog nail, bleeding may occur during the first 24 hours after treatment. To prevent future problems keep the nails trimmed and be careful when clipping or using a dog nail grinder." Dog Nail Tear Revealing the Pink Quick, The Part Of The Nail That Contains Blood Vessels. Do Not Trim The Nail Yourself and See A Vet. Protect the Injured Nail Before Going to the Vet By Wrapping the Wound With A Dressing, And Then Cover With a Loose Fitting Sock. Dog nail problems such as tears may seem minor, but can lead to serious complications such as infection. Any age or breed of dog can injure a claw, with those with overlong claws being the most vulnerable. 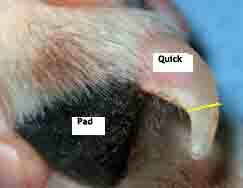 Dog nail problems can cause complications since it is a painful condition. When the claw is torn or avulsed, the claw bed is left without its protective claw covering. 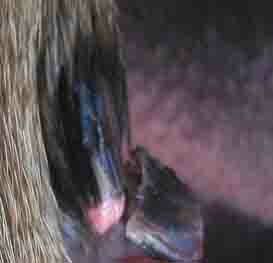 If the injury is ignored, dog nail bleeding from the exposed claw bed can occur. The area can become infected, which can then spread into the bone causing a more serious problem. 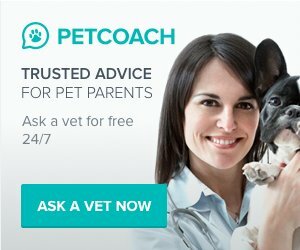 If your dog is in pain avoid home treatment since touching the area could result in getting bitten. 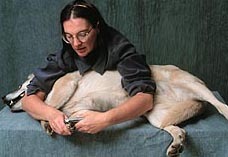 For bleeding that occurs dog nail trimming, apply pressure to the nail with a sterile cotton pall. If you have it, use an over the counter product such as Kwik-Stop or a styptic pencil that can be purchased in any human pharmacy. Note that the dog may find the bleeding paw sensitive until the nail grows back. If you are unable to stop the bleeding, see a veterinarian. A dog owner can sometimes treat a torn dog nail at home. If some of the claw is still attached, it has to be clipped off to prevent further discomfort. In the dog is not in too much pain, the dog parent may be able to do this. If the claw is completely torn off and if the dog isn't in too much pain, an owner can lightly bandage the foot and protect the claw bed from additional damage during the healing process. Owners should monitor the wound and the bandage should be frequently changed. If there are any signs of dog nail problems such as bad smell, which is a sign of infection, then see a veterinarian. 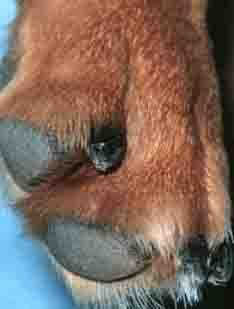 A veterinarian will treat the foot by administering a local tranquilizer or will use anesthesia to sedate the patient. The Vet will then remove the damaged portion of the claw. Depending on the wound, the Vet may bandage the foot and prescribe antibiotics to treat any infection. Pain medications and antispectics will be provided if needed. Expect dog nail bleeding from the injured area during the first 24 hours after treatment. Within two days, pain and welling should subside and the nail should start to regrow. The prognosis is excellent with treatment. Most dogs will have a complete recovery. In rare cases, the nail injury causes irregular future nail growth, which may require more frequent trimming of the nail.